Burger Brasserie is located in Paris Hotel on the Las Vegas Strip! Limit 1 per person, may buy 2 additional as gifts. Limit 1 per table. Valid only for option purchased. Dine-in only. Must use promotional value in one visit. Not valid on Sundays or holidays. 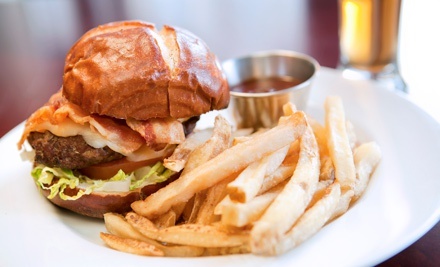 The most famous dish on the menu at Burger Brasserie is also the least ordered. That’s because not many can afford the $777 kobe beef and lobster burger topped with imported brie, prosciutto, and 100-year-old balsamic vinegar. Oh, and it’s served with a bottle of Rose Dom Perignon. But despite this dish’s opulence, most items on the menu are quite reasonable yet still gourmet. Chefs grill up classic burgers with a Parisian flair, serving them on a choice of five artisan buns baked fresh every day. In place of ketchup and pickles, the chefs incorporate common French ingredients such as brie, bleu cheese, wild arugula, and harissa aioli. They also offer veggie, lamb, and turkey patties that better complement some of the lighter flavors.